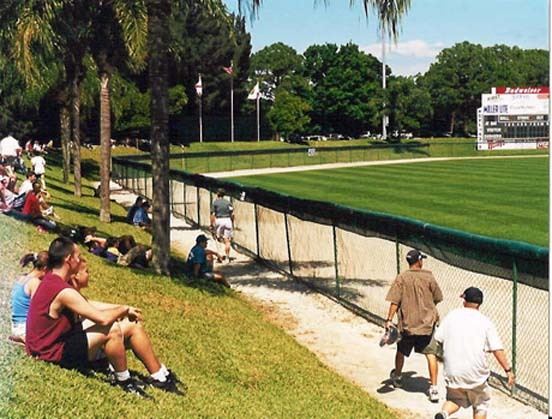 Dodgertown, which has been around since 1953, is one of the oldest stadiums you will see in Florida. It is also one of the best. Dodgertown is actually a unique area in Vero Beach that consists of practice fields, tennis courts, weight rooms, golf courses, player housing, residential housing, and even an airport- it's basically an entire community. The actual stadium where games are placed is called Holman Stadium. Holman Stadium is cozy- it has the second smallest spring training capacity. 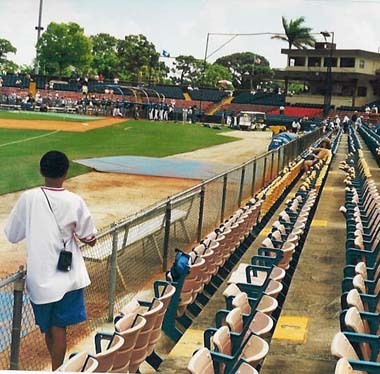 From the pictures, you will see that there are no roofs on the dugouts, and fences separating player and fan are small. All of these factors combine for a unique experience that any fan will appreciate. Holman stadium has no upper deck seating. It is just one extremely long level. While fans may appreciate not being high up, they won't enjoy having "reserved" seats that stick them on the outfield line, nor will they enjoy the sunburn they will get from a lack of shade. But hey, that's spring baseball. The seats offer somewhat of a "retro" feel due to their colors of red, blue, and yellow. Another interesting feature of Holman Stadium is its grill. The grill, which is about six feet long, cooks delicious burgers and plump hot dogs, giving Holman Stadium some of the best concessions in Florida. The aroma, which wafts throughout the park, originates at the grill right behind section 25 (almost the end of the seats) on the left field side. Holman Stadium also offers outfield lawn space for $5. While these seats may not provide the best view, they certainly are a great place for family gatherings or to catch a fly ball. 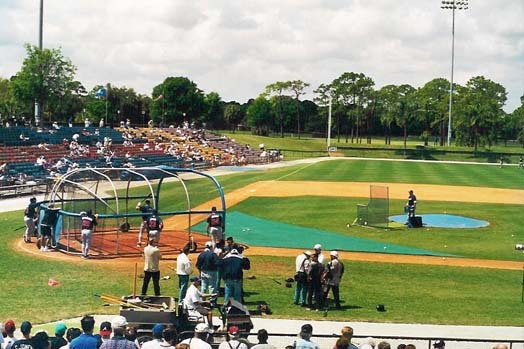 Holman Stadium at Dodgertown in Vero Beach is a great stadium and brings folks back to the glory days of baseball. Most people say that Dodgertown is the best place to see a Grapefruit League game, and I think that is pretty true. Dodgertown is well worth the long drive to Florida's East Coast and will provide a special experience for any baseball fan. Simply put, a day at Dodgertown is just a really fun experience. Another spring training must. You'll notice that there is only one level of seats, and that there is no shade for those seats either. Not too comfortable, but its worth it to see a game at Dodgertown. Here is where a lot of families sit to watch a game. The view from out here is not actually as bad as one would think. The wall is pretty low, so lots of home runs go out here. You cannot see any dugouts at all! That bench in front of the boy is where the bullpen pitchers sit. Look how close it is to the fans! Autograph tip: I do not know much about getting autographs here because I showed up to the game late. The only place I tried to get autographs was at the team bus, but since fans can get so close, give the makeshift dugout a shot before the game. They also have many practive fields here, so give those a shot.